If a car stops and has not run out of petrol, check whether there is petrol in the carburettor. If there is not, there is a fault in the fuel system. A mechanical fuel pump Check the fuel-pipeclips for tightness. Inlet valve Outlet valve The pump diaphragm,omitted here for clarity, fitsunder the brass centre cupand its outer edge is heldbetween the two halves ofthe body. Use the operatinglever to checkwhether the pumpis working. Sometimes dirt canget into the valvesand prevent themfrom sealingproperly. Disconnect the fuel line to the carburettor, slipping a plastic bag over the end of the line as you do so to catch any fuel inside. Secure the bag with a rubber band, then turn the engine over with the starter. On some SU pumps a single two-way valve on the diaphragm controls the flow. 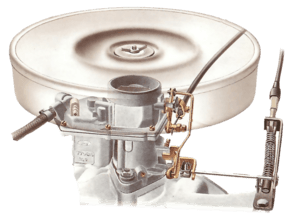 If fuel spurts out, there is a carburettor fault (See Checking and cleaning an SU carburettor). If no fuel, or only a dribble, emerges, either there is a blockage or leak somewhere in the fuel line (See Checking fuel pipes) or the fuel pump is not working. Some pumps are sealed and cannot be repaired; check to see if there are screws for dismantling. A mechanical-pump drive hardly ever fails — though signs of wear may appear on the cam and operating lever, linkages and pins. Diaphragms can leak. A small leak may affect the engine noticeably only at high speeds, but may also let petrol drip through into the camshaft area and from there to the sump. If this occurs, there is a risk of an explosion. Valves have a disc and a seating held together by a small cage. Pres- sure in one direction pushes the valve on to its seating, closing it; pressure the other way lifts the disc and opens the valve. Valves last many years, but dirt can get in and stop them seating properly. For cleaning, see Overhauling a mechanical fuel pump. Gaskets and loose fuel pipes may leak, and so may the seal between the diaphragm and the two halves of the pump body. Another occasional fault is loose mountings. The pump is often out of sight, and bolts may work loose unnoticed. This will cause a severe oil leak (See Checking for oil leaks). Unscrew or cut off clips, depending on the type. Have a couple of tapered plugs or old pencils handy to block the fuel lines in case they gush petrol when you disconnect them. Sometimes the lines are held on with wire clips which have to be cut off with side cutters. Replace them with new screw clips. Twisted wire can be used as a temporary measure. When bolts are unscrewed, the pump will pull off the clock; do not over tighten when refitting. When refitting the pump, make sure the lever is above the camshaft. If not, the operating cam will be damaged as the engine turns over. Replace gaskets after an overhaul. Tighten bolts gradually in sequence. Do not overtighten. Seal the outlet pipe(s) with a finger, and push the lever up; it should move freely and the diaphragm should stay still if the inlet valve is seating. Seal the inlet pipe and push the lever again; you should feel resistance, but the diaphragm should not move if the outlet valve is seating. Seal off all pipes and push the lever again; you should feel resistance if the diaphragm is sound and properly sealed. Seal the vent hole in the underside and push the lever, you should feel resistance if the oil seal between the linkage and diaphragm is intact. The 'official' way to test a pump is to put a pressure gauge on one side and a vacuum gauge on the other. A simpler way is shown here. Do not test the pump by blowing compressed air into it: you may burst the diaphragm. Even if you find the fault, you may not be able to mend it. If the pump is sealed, it will have to be replaced. But if there is an obstruction under the filter (if any) you may be able to get at it by removing the filter (See Cleaning fuel-pump filters). When you take the pump off, test it at once before the fuel in it dries up. Dry valves do not always seat fully.